If you’ve ever cursed yourself for procrastinating, then you’re in good company. Procrastination is one of the most widespread psychological afflictions of everyday life: it chronically affects 15–20% of adults, 95% of whom wish they could reduce it. Of course, postponement can sometimes be a wise move — you might defer a decision to buy a house because you’re waiting for the surveyor’s report or to see if house prices might fall in the near future. But this doesn’t count as true procrastination, which can be defined as ‘to voluntarily delay an intended course of action despite expecting to be worse off for the delay’. So we might put off doing our tax return, finishing the DIY, or leaving a relationship that isn’t working. When writing my new book Carpe Diem: Seizing the Day in a Distracted World, I would regularly delay starting to write in the mornings by having a quick look at my emails and social media feeds — usually losing half an hour or so in the process. I calculated that I spent at least 21,500 minutes not writing the book. In fact, procrastination is probably the most obvious arch-enemy of carpe diem living. The proof is in its Latin roots: pro is the Latin for ‘forward’, while crastinus means ‘belonging to tomorrow’. Put them together and we get ‘forward it to tomorrow’, or more colloquially, ‘I’ll do it later’ — the precise opposite of seizing the day. So here’s the big question: Is there a cure for procrastination? But there’s some good news. When it comes to the other 78%, a cure might be at hand. It boils down to four simple words: Act First, Think Later. Let me explain this with a personal example. Around a decade ago, after several years in an unfulfilling job doing community work, I was desperate to leave and start teaching my own courses on the art of living. The problem was that I was afraid. Would my courses be any good? Would I earn enough to live on? I couldn’t even think of anywhere to hold my workshops. I was jolted into action. That night, in a moment of carpe diem enthusiasm, I emailed some friends inviting them to a course on rethinking out attitudes to love and time. I had no idea what I’d actually teach. Two weeks later, eight people squeezed in around our kitchen table. I didn’t really know what I was doing. Nevertheless, it was a great success, so I invited more people and added more themes. Word soon spread, and I was asked to run workshops at a local cultural centre. After a few months I plucked up the courage to leave my day job and embark on a new career running courses and writing about the art of living. It led to me becoming a founding faculty member of The School of Life, an organisation that started in London and now has branches around the world. What was really going on here? One of the most common approaches to personal change, which draws on Enlightenment thinking going back to the eighteenth-century, is to think and reason and plan before taking action. This is what career counsellors usually advise — to plan, plan, plan then start sending out job applications. It’s essentially a philosophy of Think First, Act Later. Often we just procrastinate and end up doing nothing more than planning. The decision to run that first workshop embodied the opposite philosophy: Act First, Think Later. This is based more on an experiential learning approach to change. We discover who we are and what we care about through being immersed in the white heat of experience. When we understand this, procrastination no longer seems so attractive. We should be aware, however, that experience can be a cruel master. Our seize-the-day experiments will almost certainly entail risk and could well end in failure. But what of it? We all know that making mistakes is one of the most effective learning tools devised by humankind. Roman Krznaric is a British social philosopher. 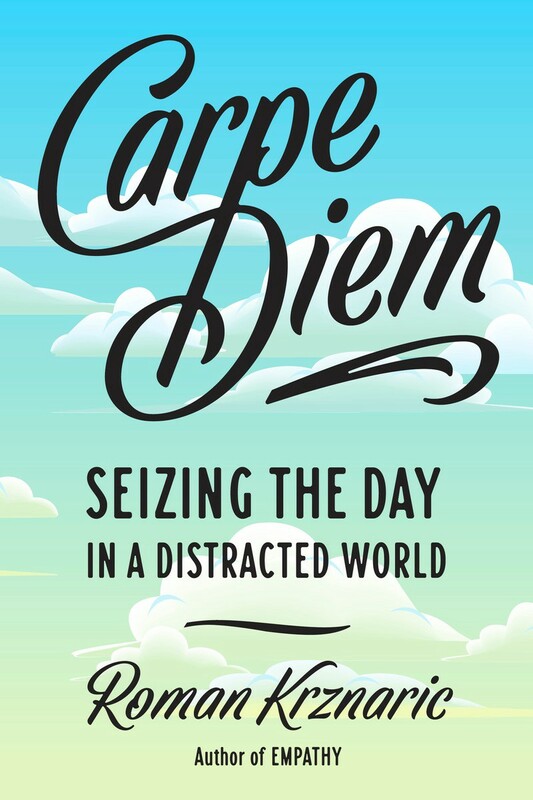 His new book is Carpe Diem: Seizing the Day in a Distracted World (TarcherPerigee/Penguin Random House). Find out more at www.carpediem.click.